One of the musts of being in the north of Vietnam is visiting the stunner which is Halong Bay. 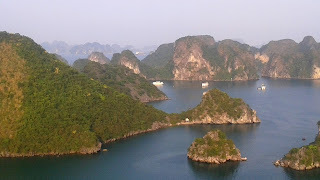 Gorgeous natural beauty, an ancient bay full of, erm, little tree-covered mountains ('towering limestone islands topped with rainforests', describes google a bit more poetically) popping out from the sea. The name translates as 'where the dragon descends into the sea'. 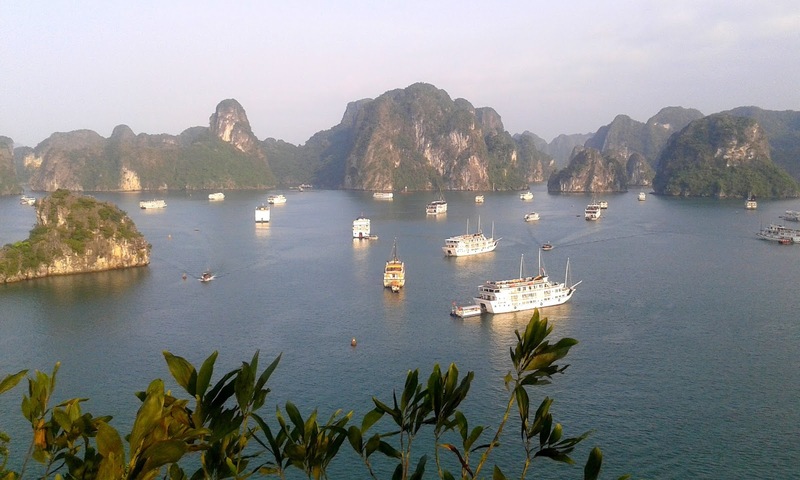 Apparently the simplest and best way is to do a two-day tour of it - a few hours in the bus from Ha Noi to Halong City, then you get on the cruise boaty thing, cruise along Halong for about 24h, then come back to Halong City, and bus back to Ha Noi. The bus rides were pretty uneventful, except I spent an amusing/horrific half hour counting the amount of dog meat restaurants I saw on the side of the road. Thit chó. I got bored of counting at eleven. Especially in more rural northern Vietnam, dog meat is Da Meat2Eat. Most places also had a handy little picture of a cute dog on their food advertising sign, just in case you were doubtful. A few places offered the tempting extra of 'thit mèo', cat meat. Once we got to the bay, we clambered into a little wooden boat, were given life jackets, and set off to find our cruise boat. The life jackets had to be returned before getting off the boat and, as Paul pointed out, it was pretty ironic that you were given a life jacket for the safest leg of the trip. It's highly unlikely you would suddenly drown whilst on the boat - death by water would be much more probable while trying to jump on or off the rickety boat. Our cruise boat was “Lemon Cruise”, most commonly pronounced “Lemon Roo-ee”, sometimes “Roo-eez” if you were lucky. Our guide was this adorable young man, very enthusiastic and keen and very clearly on his, if not first, then max. second shift of this job. LOTS OF GOOD FOOD. When you're on a budget tour, you don't expect the food to be massively amazing or interesting. With Lemon Rooee, however, you are wrong. Every single meal included a million different courses, different Vietnamese foods, salads, fruits, everything. So good. Visiting the 'Surprising Cave' which was, surprisingly, surprising. It's this huge cave inside one of the islands. Not something I had put on my top priority list of things to do, but it was actually really cool, and when you fell back from the group you could get quite a nice set of photos. Be careful though if you have the elderly hypertensive heart disease!! Our guide was being fun and cute pointing out different funky rock formations, asking us what shape we thought they were. Dragon or dinosaur or cow etc.?? Yes, well for the first five it was fun and cute, and then it started getting a bit tedious. Especially when, boosted by the giggles from the otherwise rather timid group, he spent a whole awkward five minutes trying to keep our attention on this unfortunately shaped rock which, according to him, was a giant forefinger pointing upwards. I'm sure, dear guide, you will learn, in the future, that jokes are best left alone after you share them once. Note the forefinger on the left. Courtesy of Steffy. Canoeing!! Which was perhaps the most awesome moments. Canoeing on the Halong Bay. We had an hour when we could canoe wherever we wanted. The freedom – and the caneoing – was pretty exhilirating. It was one of those reality check moments - am I actually in a canoe, going round the crazy limestone islands topped with rainforests of Halong Bay, Vietnam!? It was amazing. Climbing to the top of the Russian Beach. The views were the ones you see on all the postcards, absolutely beautiful!!! Definitely one of the most picturesque places I've been to. The steps were a killer though. Cooking class. Yes, sounds good, right!? You learn how to cook a Vietnamese dish, what spices to put, probably you'll get to cut, cook, mix, whatever you do when you cook!? No. We were hustled into the dining area of the boat, where we were gonna learn how to 'cook' spring rolls. Well, we got to roll the insides into the spring rolls. That's it. The veggies had been cut and prepared, the rice paper had been prepared – all we did was that some lucky volunteers got to stick some cut veggies into a rice paper and roll it up. The end. Illegal little boat-buyings: When we got back to Lemon Rooee after our excursion, we were greeted by a little lady on a little boat selling drinks, snacks etc, the kind of stuff you'd get from little boats on the Mekong Delta. We looked at some of the stuff with interest. I knew that we weren't allowed to consume anything not bought on the boat. (We got free food, but any drinks cost money. A lot of money.) I also knew, forgive me, that the Vietnamese are not famed for being direct about saying stuff. So – don't ask, and you won't be refused, right? Mr Tour Guide was eyeing us warily, and when the kiwi couple who were in the next door cabin seemed actually intent on buying from the lady, he came towards us, and 'recommended' we didn't buy from her. “Oh, why?” the kiwis were genuinely concerned. Mr Tour Guide explained how it's probably “low quality”, that the seals on the cans, for example, were not 'good quality'. “Oh, really?” said the kiwis, genuinely confused. “But they look the same as all the others...?” “Oh yes, low quality, low quality,” assured Mr Tour Guide. The kiwis looked apprehensive but not convinced. “Oh,” understood Paul, “do you just not want us to buy?” Exactly the question not to ask. “Yes,” said Mr Tour Guide, relieved. Well, he left, and we were naughty, and bought anyways. Squid fishing. Not something I wanted to partake in, but it was exciting watching it happen though. Squids like it at night, so it happened in the evening. You had something at the end of a fishing stick, and you could see the glow-in-the-dark (sort of) squids circling them. Oyster farming. This happened early the next morning. The main thing it taught me, future husband take note, is that I never, ever, ever want real pearls. A lot of hanging out on the deck. Which was fun. The four of us played loads of card games, had lots of good chats and just enjoyed the Halong Bay-ey ambiance. 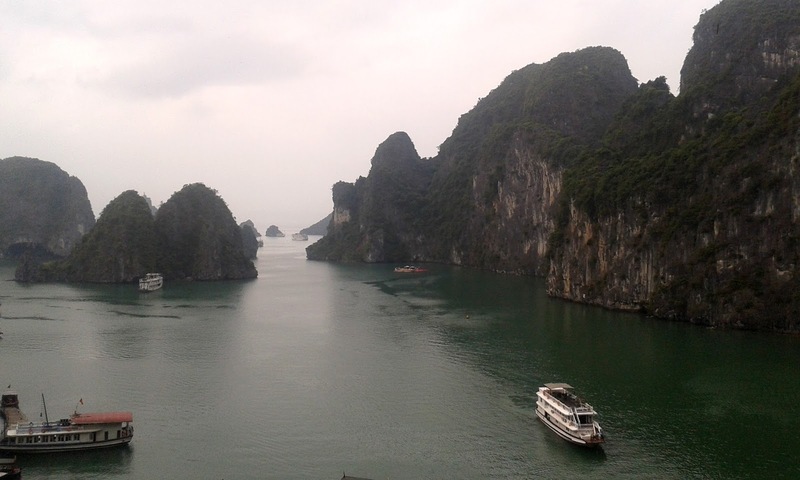 Halong Bay was beautiful. A gorgeous, incredible natural wonder and it was a really enjoyable trip. I think, maybe, I had super high expectations for it since it is, for a good reason, one of the top places to visit in Vietnam. However, you did feel very much that you were on a very, erm, touristy trip. It was quite disappointing when we realised that, despite this being a 'cruise', we literally were just in the same area the whole time. You could see the bridge of the mainland from every point where we were at. We just essentially circled Russian Beach island. Ihanannäköinen paikka todellakin. Ja blogijutustelusi oli humoristista ja kiinnostavaa. Olen itsekin muuten epäillyt helmien "eettisyyttä". Enpä omista yhtään, eikä ole tarviskaan. Does the variety of meat on offer make you want to be a vegetarian, or are you content to stick to cockroaches? Those tree-covered mountainy things sticking out of the water are quite amazing, and must be even more amazing when viewed from a canoe looking straight upwards.